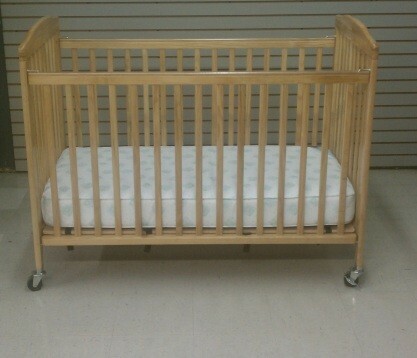 Full size wooden folding crib with 5" coil spring mattress included. These cribs no longer have the drop side which has been banned to produce, sell or use by the CPSC. Meets CPSC safety standards 16CFR1219 put into place 12/28/12. No tools needed, just unfold and lock to secure. Limited quantity, subject to availability. We have crib sheets available to rent or bring your own. Crib is CPSC certified. All baby items are returned to the store after every rental and wiped with disinfectant. Includes a deluxe coil spring mattress.These cribs no longer have the drop side which has been banned to produce, sell or use by the CPSC. Meets CPSC safety standards 16CFR1219 put into place 12/28/12. No tools needed, just unfold and lock to secure.